Pauline II can accomodate up to 6 people. The apartment consists of two bedrooms (both with double beds) and a living room (with a double sofa) connected with a fully-equipped kitchenette. Free wi-fi and TV-SAT are also available for our guests. 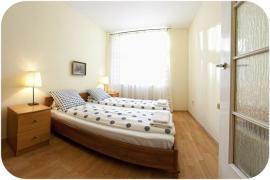 The apartment is located right next to the Nowy square - a place filled with legendary cafes (e.g. Alchemia) and clubs (e.g. Taawa). There is Galeria Kazimierz shopping mall (including a cinema) in a walking distance from the apartment. Moreover, there are also the most famous tourist sights in the neighbourhood, such as: the old and new Jewish cemetaries, seven synagouges and Bożego Ciała church amongst others.